I need some advice please. I am newly married - since July 2010 - and this is our first house. We are doing our best to make it comfortable and romantic but this is difficult! 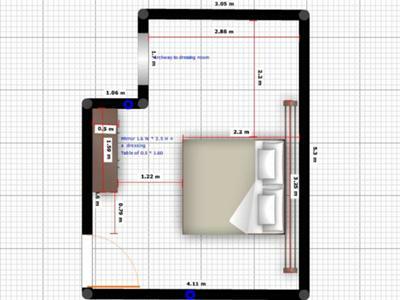 I have attached our bedroom plan and we are wondering where to install an LCD TV!!! Usually TV's in bedrooms must be in front of the bed but in our bedroom we have a huge mirror and only a small space which is complicating our thoughts. We have designers around us but believe me, I saw a couple of things they did and I could do better! Please check if you can help us with some advice and thanks a lot for your time and for reading my email. Thank you so much for writing in and many congratulations on your recent marriage. The placement of a TV in a bedroom is quite difficult. If the the TV is not in a place where you can comfortably lie down in bed and watch a movie then you simply won't use it. Like you, I don't have an obvious place to put a TV in my bedroom so I find that I always prefer to stay in the living to watch TV as the TV is so well positioned for the sofa there. 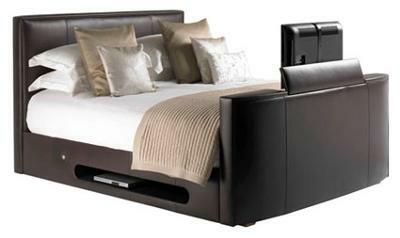 What I intend looking at in the near future, and what I suggest may be an option for you, is to purchase a TV bed. As you can see in the picture above, the TV is built into the bed frame giving you a great view but it disappears when not in use. I think this is the perfect solution to your dilemma if this is within your budget. I'm afraid I can't see easily on the plan you have sent but if the TV bed isn't an option, can your bed be moved to somewhere else in the room where the TV can be positioned to face the bed end or alternatively mounted on a wall bracket so it can be against the wall when not in use but 'swung round' when you want to view something?